Julia's Kitchen Wisdom is a must-have. Who better to get the basics of cooking from than the legendary Julia Child? This is a little, very un-intimidating paperback that teaches "essential techniques and recipes from a lifetime of cooking." Learn bases for soups, salads, dressings, meat dishes and more and how to vary them in multiple ways. Discover what flavors -- some surprising -- pair well together. Learn easy substitutes for when you run out of a certain spice or other ingredient. Soon, the boldness that comes from knowledge washes over you and sky is the limit! Produce. Ours now mostly comes from the garden, but if you are unable to grow most/all your fruits and veggies, subscribing to a Community-Supported Agriculture box will ensure eating local and in-season with ease. Dairy. Keeping a steady supply of dairy products on hand (if you eat diary, that is) is a big deal: cheese, cream cheese, creme fraiche, buttermilk, and milk are items our family can't seem to live without. If you are looking to find a good source of local dairy, check here. Meat and eggs. Keeping options diverse promotes health and broadens palettes. Each week, try making one dish with beef, chicken/turkey, fish, eggs, and maybe one night branch out and try something new (venison or other game, duck, goose...). Try creating a meatless dinner at least once a week. This is a big relief for the old grocery budget. If you are looking for a good source of local meat and eggs, here is a good resource. Grains, starches, and/or grain-free flours. Keep a good amount of these dry staples. We eat about 90% gluten-free and the cheapest way to do this is skipping all the gluten-free products out there and making meals with rice, beans, potatoes, and sweet potatoes. In doing so, the dishes you create will be so much less processed. Using coconut and almond flours sparingly (about twice a week) is a good way to bring variety and boost fiber and protein intake. Constantly expose yourself to inspiration. Be ever on the lookout for an intriguing recipe. Subscribe to a few food blogs. Create a Pinterest board to organize yummy finds. Splurge on a new cookbook or magazine every now and then. Even if you don't follow the recipes you find to a T, they can spark new ideas for old, familiar dishes. If learning to cook on the fly is a new thing, be sure to lavish yourself with lots of grace. Every new change involves a huge learning curve. Allow it to run it's course and glean every bit of wisdom along the way. Above all, make room for enjoyment and experiment. Don't let the flops get you down; they happen to everyone. Keep on keeping on, and before you know it, kitchen wizard status will be attained. Love this! I've been drowning in guilt for so long because I don't menu plan....but after reading this I realize this is actually how I cook, and it works for me :). Kinda helpful to hear someone promote this as a good way to go! Great ideas. I must buy the Julie Child book soon.Tthank you for this helpful post! Yes I think this is what I do. I have the ingredients to make our family favourites on hand, and if I'm ever pressed for time, I pull a container of leftovers out of the freezer and reheat it for an easy meal. 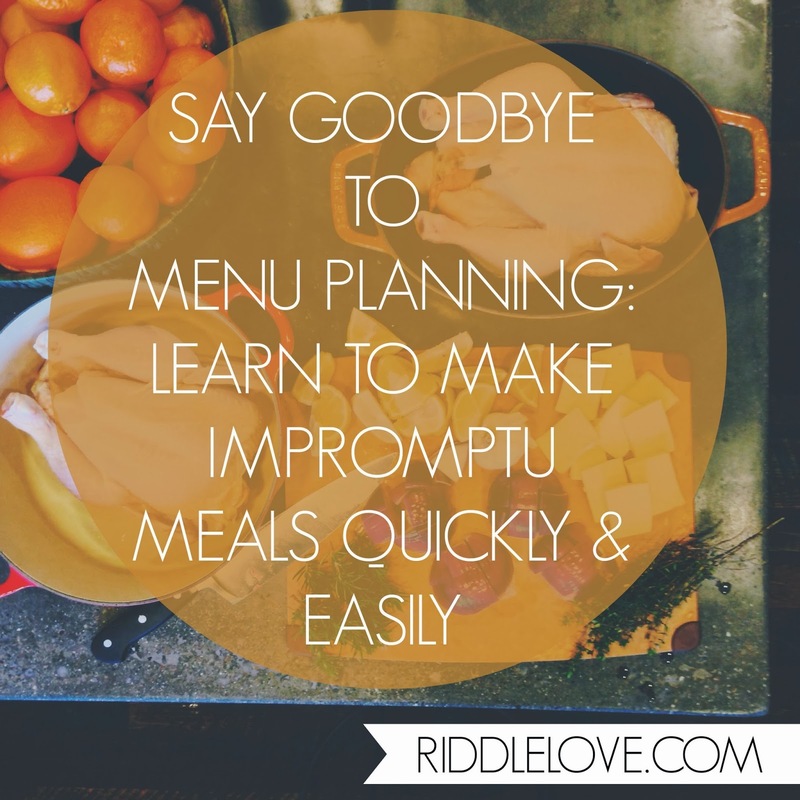 This post inspires me to be a bit more creative, but I feel like I'm still "stuck" in traditional menu planning. I eat organic + vegetarian, while my guy eats anything meat/dairy related. That adds a little twist into trying to plan and/or be creative in the kitchen! I'm going to check out Julia's book you recommended... thanks! You have built a beautiful house that you can now fill with love, but you have always had a home. Its not what surrounds you that makes a home its love and family and you are blessed. Congrats on being debt free, it is something more people should aspire too! We lived in a trailer for six months while building a house in Mexico. We also had five kids at the time, and although it was one of the most difficult times in my life, God cemented my family together in a special way by having us go through such intense times together. Just made this - one batch with jalapeno, one without. Deelish!! I believe next time I'll grate the garlic so it's more invisible.